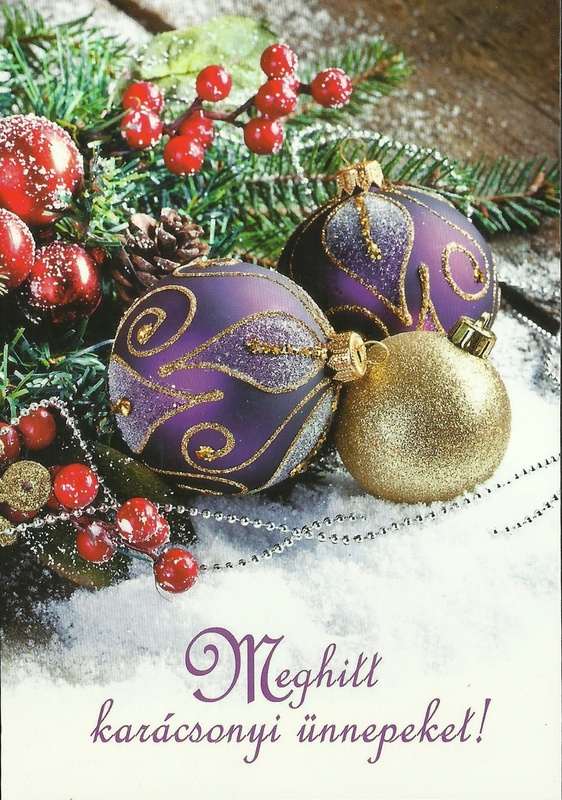 I received several Christmas postcards in late 2016 and early 2017 as the result of joining a swap club on Facebook. 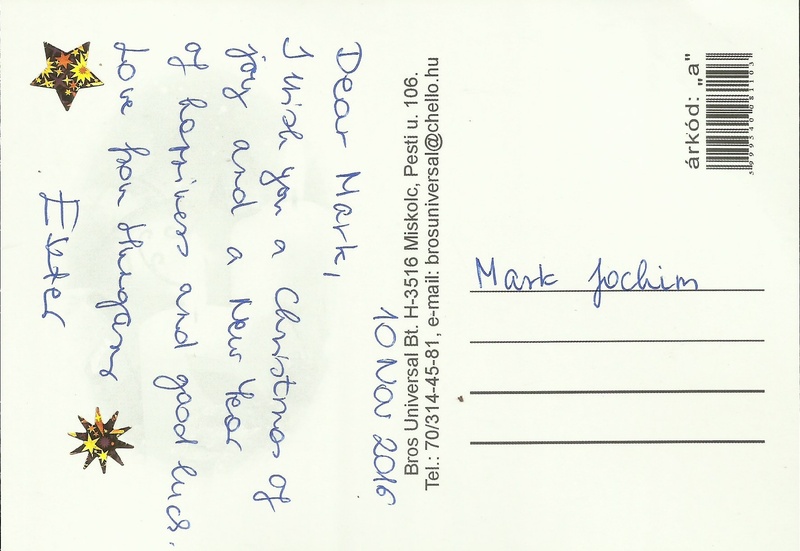 This postcard arrived in an envelope posted in Pély is a village in Heves County (Heves megye) in northern Hungary. This is a geographically diverse area; its northern part is mountainous (the Mátra and Bükk are the two highest mountain ranges in Hungary), while at south it includes a part of the Great Hungarian Plain. From south it is bordered by Lake Tisza, the largest artificial lake in Hungary. While I much prefer postcards mailed with the stamps on them, the envelope this one was inside contained four nice stamps from Hungary. The oldest was issued on June 30, 2000, as part of the nation’s Antique Furniture series of definitive stamps. In the German-language Michel catalogue, the 30-forint stamp was assigned the number 4609 and features a chair made by Károly Nagy in 1935. It was printed using offset lithography and is perforated 11½ x 12. The second stamp is another definitive in the Antique Furniture series, a 10-forint stamp released in 2001 and featuring a 17th century chair. It, too, was printed by lithography but is perforated 11½ x 12½ and has the Michel catalogue number 4551II. The 85-forint stamp on the envelope was released on May 3, 2013 (Michel #5631). It pictured the Votive Church and Cathedral of Our Lady of Hungary (Szegedi dóm or Fogadalmi templom), a twin-spired church in Szeged. It lies on Dóm square beside the Dömötör tower. Construction began in 1913, but due to the outbreak of the First World War, it was not completed until 1930. The church serves as the cathedral of the Roman Catholic Diocese of Szeged–Csanád. Finally, Michel #5783 commemorates Zsolnay, or formally Zsolnay Porcelánmanufaktúra Zrt (Zsolnay Porcelain Manufactory Private Limited). This is a Hungarian manufacturer of porcelain, tiles, and stoneware. The company introduced the eosin glazing process and pyrogranite ceramics. It was established by Miklós Zsolnay in Pécs, Hungary, in 1853. The 270-forint stamp was printed using offset lithography, perforated 12½ x 12, and issued on July 3, 2015. 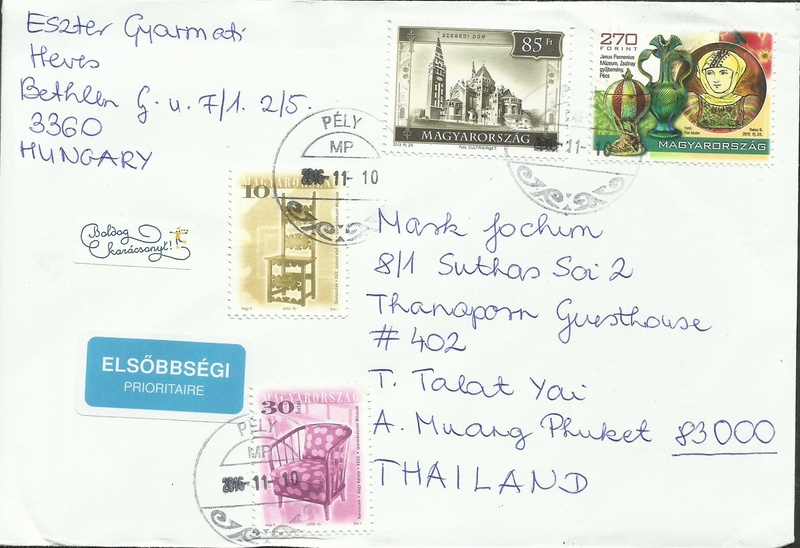 Mailed from Pély on November 10, 2016, the envelope enclosing the postcard arrived in Phuket on November 26.